Wow - What fabulous samples -- that package [3rd one?] is so fun with the flower arrangement~ Well done! Wonderful projects! Looks like you had a lot of fun playing with this new release. I had fun seeing what you created. LOVE the Kraft package. Just stunning! And the last card just captures my eye! I cannot stop looking at it! Gorgeous samples Joan! All great projects, but i am in love with patterned paper (packaging) you made with magnolias... so stylish!!! Need this stamp set!!! Gorgeous! I especially love the package! Wow... four amazing projects! LOVE the Mother's Day tag and the beautiful wrapping paper - lovely presentation! every single project is amazing, dear friend! you have hit the big time! Amazing projects. Hard to decide if I have a favorite...they're all wonderful. What a fun blog! I will be back. 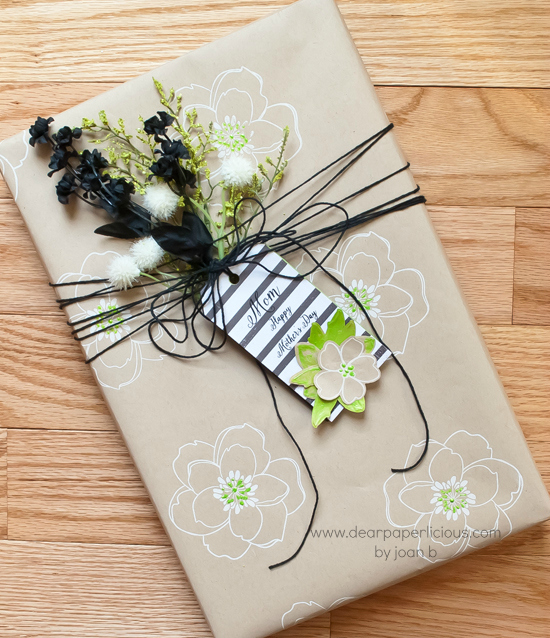 That kraft paper with white embossing and touches of green and the black and white tag and the gorgeous bloom.... I am pinning that for sure. Wow! all your cards are gorgeous Joan - and i love the tag for your mom - i remember sending her a birthday card once - i think i have to have the whole release! 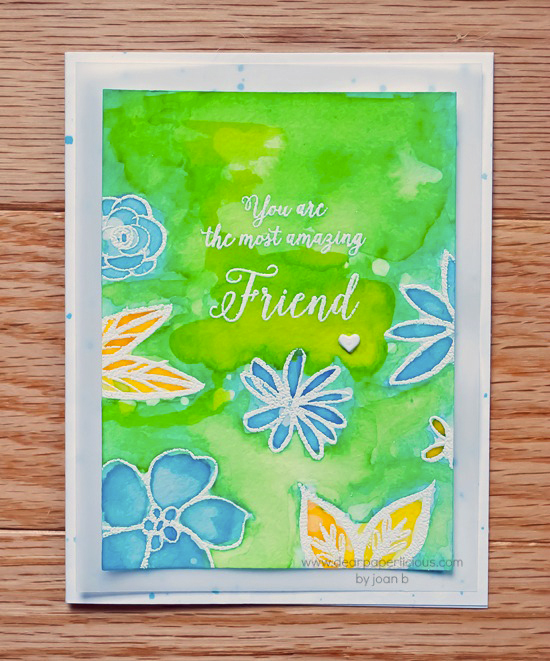 Love the way you used watercolor on some of your cards! Pretty cards! I think the last one is my favorite. Beautiful cards! My favorite is the black, green, white combo. Absolutely wonderful! You totally rocked this release! Such inspiring projects! Wowza! My jaw hit the floor when I saw the wrapped package. Stunning, I tell ya. It's clear you were mondo inspired by this great release! WOW - so much gorgeousness all packed in one post - amazing, and so so so beautiful!! Love the collection of cards you made with the new sets. Just beautiful! LOVE all your projects! The gift wrap and tag are truly amazing. The lime green with the black is perfect. Thanks for the chance to win some Julie goodies! Absolutely love the Mother's Day card. If my mom was alive, I'd case it and give to her. Beautiful. I love the way you put everything together! The wrapping paper and package add-ons are just beautiful! What awesome projects! Love the watercolor and wrapping paper. You really went to town. Love your wrapping paper! Love the black and white touches! Oh wow, inspiration overload! So much to love here! I especially love the pretty gift wrapping and tag; so fabulous! Gorgeous cards. Love seeing the versatility of these products from one artist blog to the next. This release is simply AWESOME! Great cards. Your imagination and design sense is great. I like the last card with the explosion of colors. WOW! The watercoloring is amazing. Love the card. This is an amazing group of cards, each prettier than the last. A wonderful selection of cards. Your tags are sweet. 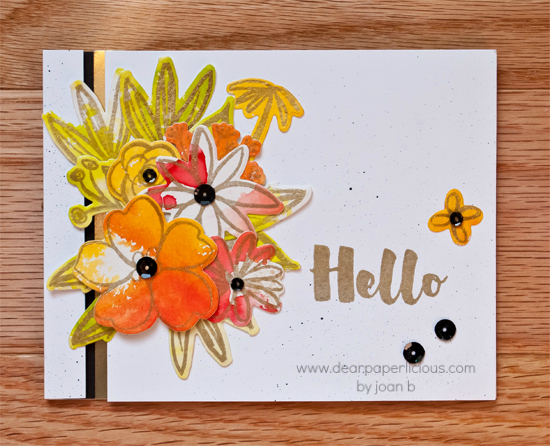 Beautiful cards and I love the way you created the backgrounds and your use of the dies....that Bohemian Garden die is fabulous. Love it all, but that package wrap treatment has my heart. What a glorious use of this great release. Thanks so much! I do love those flowers! These are all gorgeous, but I especially LOVE that gift wrap! What white ink did you use?? Love the flowers! Very creative! Beautiful cards! I love you creativity! Thanks for sharing. I love the design an combo of the tag. very different. all are lovely. Neat cards. Lots of different ideas. Mondo congratulations to you! Love all the possibilities that you showcased today. Your cards are just wonderful! Alot of inspiration here. Joan, your cards are all so pretty. Who couldn't use those sentiments? They are lovely. Wow, so much inspiration! Beautifully done! Thanks for showing how many different ways these products can be used. Joan these are all gorgeous! So nice to see your "loosey goosey look" ! Beautiful and very fun. Love the look! really "diggin'" the bohemian florals. bet Mr. Paperlicious loved his card! How fun and artsy are those Bohemian Garden images? Hi Joan, I love any well designed card that conntains lime green. So you had me and kept the way. Great projects. Love your all of your creations. Impressive number of them too! Thanks for sharing your talent. Absolutely wonderful postcard! They are very different, but equally beautiful! Wonderful projects. The package and tag are real show stoppers. Love how you used the flower for the background of the package wrap and the bouquet of flowers ios striking. Some many amazing projects! Super talented! Here is someone with non-stop ideas... Great use of the release products. These are all amazing, but WOW, your last card really knocked my socks off! Love it! Gorgeous, Beautiful etc. You are right, the Mondo Magnolia is Mondolicious. I love it. Love that tag and all the ideas...thanks for sharing your creativity...first time I've been to your blog but I will be back. thanks for sharing so many wonderful ways to use these fabulous new products! AMAZING projects, I especially love the stamping on the kraft gift wrapping and tag. LOVE the vibrant colors in your water coloring with the reinkers too, thanks for sharing! All of your projects are fantastic! Such great inspiration, thanks for sharing! So many gorgeous projects! Wow! Love them all! Wow, all of your projects are absolutely amazing! Really pretty cards. Great ideas, great new release. Your cards just make me smile. Lovely. Love the gift wrap!! It's really a cool modern twist on the feminine theme!! great job. thanks for inspiring! Wow this release has so many beautiful products! Joan-I love your samples. Thanks for sharing and for the chance to win. Fantastic cards and tag Joan. Especially love the first one with the gold and black... and the last one. The water coloring looks awesome on the pretty flowers. Your wrapping paper looks gorgeous! I don't think I would open it up! Beautiful projects - my favorite is the gift box and wrapping paper! Gorgeous projects! Such fun colors. I especially love the Mother's Day gift and tag. 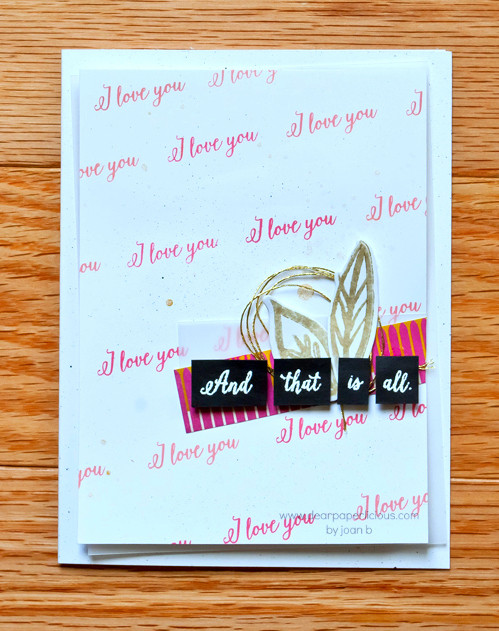 I love the simplicity of the magnolia stamped on the craft paper with the simple center. Gorgeous cards! Love these sentiments! Beautiful projects. The gift paper is gorgeous. You are truly and artist. Thanks for sharing. So creative and so pretty - thanks for showcasing the new products. Thanks for the clever card ideas. They are all really beautiful. That magnolia is mondoliscious! Beautiful card! really creative ideas!! Wow! Each one of your projects is more gorgeous than the last. Love them all. Such amazing projects! I love your style. i am so amazed that all creations on this blog hop are all different. such talent, thank you for sharing! That flower one with the green background is fantabulous now we get to see it all. I like the rich warm colours in the second floral one, but those brights make me happy. wow they all showcase that floral set so well!!! Really colorful and pretty cards,but the gift paper..winner for sure. Thanks. Beautiful stuff Joan! My fave is the gorgeous kraft package. So much inspiration! Thank you, Joan! I think this blog hop is the first time I've landed on your blog, and I am signing up! You've got yourself a new follower. Absolutely LOVE everything about the gift package you created. So beautiful, and a lovely tribute to your mom. I so know what you mean about you think she'd love, or you never know, maybe she'd go snarky on you! LOL! Good stuff. Will be back, for sure! These are all so pretty, but that gift package knocks my socks off, WOW WOW WOW!! Wow, all of your samples are gorgeous! Love the gift wrap and tag. Great cards and lots of fun versatility! Thanks for sharing!! Such wonderful inspiration from your beautiful creations! I love this new release. Beautifully done. This is a wonderful collection. Wow! Absolutely beautiful...the variety and creativity in these cards are amazing! I particularly like the first one featuring the sentiments! Beautiful cards!!!! The sentiments really shine with your designs! This stamp set is just beautiful! I really like the first card with the repeating sentiment and your mother card and tag set - so elegant! Thanks for sharing! Your designs are fantastic. I'm loving all these flowers! Maybe it will finally dry up around here and I'll get to see some real ones--but yours satisfy me in the mean time! what beautiful projects!! thanks for sharing! Fabulous ideas...love all the ways you used these products. Really gets my mind going. Great cards and wonderful gift paper and tag--gorgeous. Nice projects, but I really like your stamped kraft wrapping paper -- so pretty! oh my word. you guys are killing me!!! that wrapping paper....amazing!!! Love the tag and matching wrapping paper. So creative! All of your cards are sweet but I really liked the vibrant orange card. So much talent and you are willing to share it! Thank you from a newby! Beautiful cards. I like the font on the amazing women stamp set. I really like the black and white striped Mother's Day card. Love your cards and that packaging is awesome! Thanks! I like all of your cards (thanks for so much inspiration) but I am especially drawn toward the color combination in your gift wrap and tag. So lovely, and I think it's wonderful that you were inspired by your mother for this project. Thanks so much for sharing your creativity, and for the chance to win a fab prize! Love all your projects great idea for a present. Love them all. Thanks for the inspiration. I love your package. So fabulous! Beautiful collection! I am in love with the first card! Simply stunning. Very beautiful. So many possibilities with this set. Fabulous cards and tag Joan - I love them all! I love all of your projects and especially the way you used the sentiment as a background! Holy cow, you've done these new products up proud. Gorgeousness. Love your water coloring and your cards!!! Love these new stamps and dies! I love all the wonderful color combos. Great release! The craft color with black is a great combo. Thank you for sharing your creativity. Simply stunning projects! You are so very creative in many ways! OMG...could you have possibly created any more diverse and stunning projects!!! Whoa!! Hi Joan - Your mondo-awesome custom gift wrap is AMAZING! I've loved all your projects and peeks the last couple of days and glad you were hopping! I love your cards, and I was so happy to find your blog again! Thanks for the chance to win a great stamp set! Love the watercolor floral card. Beautiful. You're on a roll! Your projects are gorgeous! Love the tag & the Bohemian card. Great projects! Love the tag. Beautiful variety of projects with these new products. Love your samples, and those bohemian flowers! I love all of your projects! Wow...love all of the cards...so beautiful! What fun, pretty cards! 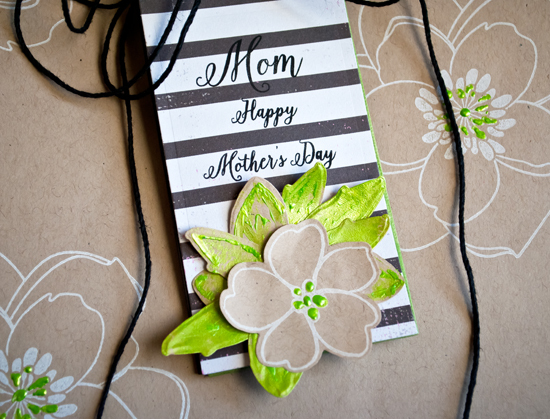 I love the black and white with pops of color on your Mother's Day tag. It's so pretty! Super variety of cards. All gorgeous. Love the colors, sentiments and flowers. Love all of the beautiful colors! Great projects. I love your gift wrapping. So colorful..all of the cards! Well done on all the cards. I must admit that I am partial to the last one. Wow what wonderful and varied cards. Adore the kraft packaging and tag! Beautiful cards! Love the colors you chose. Wow your cards, tag and wrap paper are all wonderful. Thanks for sharing. I love all your cards, and I am sure your hubby will love the one for him too! This is an awesome release! Beautiful creations. Thanks for the chance to win. Wow, you were very busy. Fun projects. Beautiful projects! I really love the packaging you came up with! loving the use of the I love you stamp from this set to make your own background paper :) I try to this myself as I find it hard to find just the right color options sometimes in New Zealand. great work and fingers crossed for some luck to come my way or good luck follow crafters and I envy whoevers has luck on their side and gets this set, ITS LOVELY by the way. Elizabeth Gardiner. You create such gorgeous things! Wonderful! Great job on all if your cards! Sorry to hear about your Mom. I lost mine long ago when I was in my 20's. I am sure she is looking down from above and loving what you made from her inspiring you! It looks like you had great fun making these! I particularly like the last two samples. Thanks so much for sharing your ideas. wow all your cards are so beautiful, but my favorite was the first and the last card, there are amazing! Great creations! Love all the artsy-ness! All such great cards & the wrapping paper you created with the finishing touches is awesome. All about presentation! I love the eclectic feel of your cads. Really nice cards. Absolutely love your mothers day card. I bet your mama would too! Gorgeous projects! I really love the package, its so beautiful! Joan, such beautiful cards. I especially love using the "I Love You" stamp for a background and of course the Bohemian Garden Explosion is just that, an explosion of color. So inspiring. Thanks for sharing your creative talent. I, too, am Mondo Happy with all your beautiful cards, Joan. Amazing Women is the perfect set and great font, but my true love is Mondo Magnolia (as shown on your Mother's Day card). Wow! What a bunch of wonderful projects, this release looks awesome. Love the beautiful script font of this set! Your projects are beautiful! I love how you used that big magnolia flower. Your projects are amazing! I especially love the package wrapping project. Just gorgeous! Beautiful work! Love the mothers day tag! Fabulous cards made! Love it! My fav is the packaging. Inspiring.